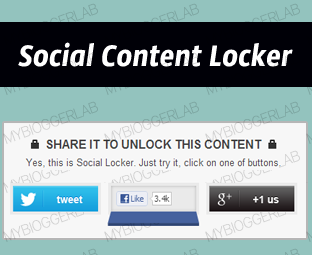 Social Locker consists of three social buttons and a locker displaying horizontally. The Social buttons consist of Facebook, Twitter and Google plus. Whenever, a person would either press Like, Tweet or Plus one button it would display the hidden content. This allows a person to get more real social followers. Feel Free to enjoy the Following Real time Demo. For Facebook: Replace http://www.facebook.com/bloggerus with your Facebook Page. For Twitter: Replace http://www.bloggerus.com with your Website's URL or etc. For Google+: Replace http://www.bloggerus.com with the URL of your website or post.